We're in Texas, so you *knew* there was going to be a barbecue post, right? Well this is it. We did a lunch run out to Lockhart Texas, a small town about 40 minutes South of Austin which is one of the hubs of Central Texas barbecue. First up was Kreuz Market. The aroma in the parking lot hit us as soon as we got of the car - lovely, savory, smoky goodness. The meat (other than the sausages) is sold by the pound. You don't need to order a full pound, though, so you can try a variety. Since there were only two of us and we were going to eat lunch at two BBQ joints in one day, we tried to keep our portions reasonable and didn't get to try it all. We ordered a quarter pound of brisket, a hot sausage and a pork chop (no sides - we only had stomach room for the main event). They toss it on butcher paper with some slices of white bread and plastic knives (see the "no forks" rule in the picture above). The sausage was very good, and the pork chop had a great smoky flavor. 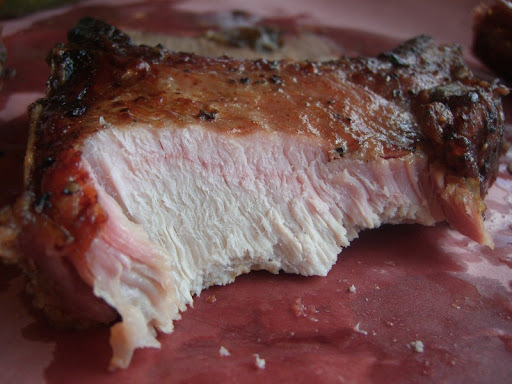 It's hard to see in the photo, but the pork chop had a nice pink tinge to it above the smoke ring. The standout, though, was the brisket. Fantastic! I've never tasted brisket even close to that good. Amazing meaty taste, and the fat melted in your mouth (check the picture at the top of the post for a close-up of the fat on the Kreuz brisket). Ready for more, we drove down the road a few blocks to Smitty's Market. Smitty's is a smaller, more cosy place than Kreuz. This time we ordered brisket and sausage. I thought that the sausage was not as good as Kreuz - less flavor and a more soft texture. 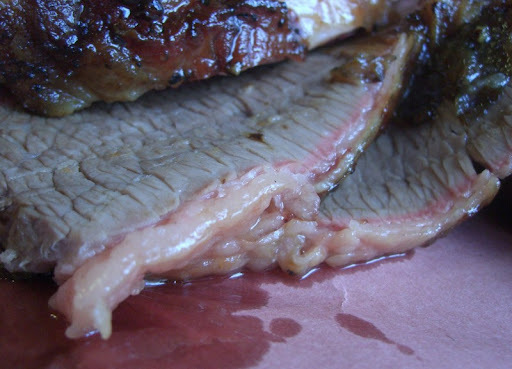 As for the the brisket? No contest - it wasn't in the same league as the slices we had at Kruez. Nowhere near the same intense, smoky flavor. Overall, a truly delicious and enjoyable experience. Awesome Mike! I've been told that Lockhart is the "Capitol of Texas BBQ". 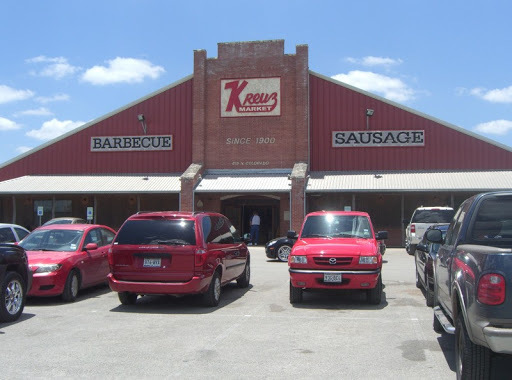 Isn't there some kind of family feud story behind Smitty's and Kreuz? Yeah - I'm not sure what the details are, but it seems that something happened in 1999. 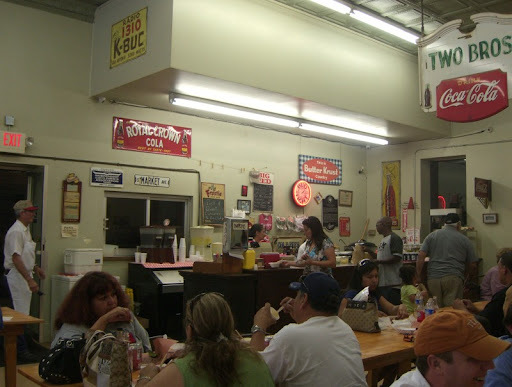 That's when Smitty's started at the original Kreuz location, and Kreuz moved to their new location. 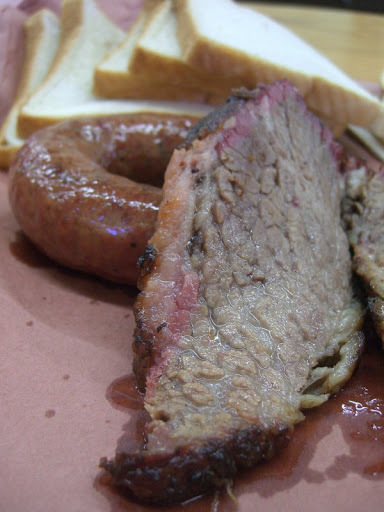 "Smitty’s began around 1900 as Kreuz Market, a German butcher shop that sold fresh meat during the week and smoked whatever was left over on the weekend. 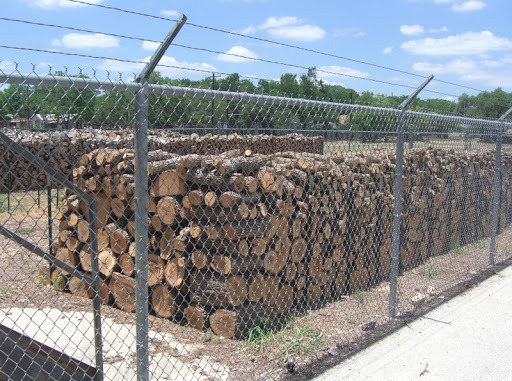 The Kreuz name endured even after Edgar “Smitty” Schmidt bought the business, in 1948. It was still in use in 1999, when a dust-up among the late Edgar’s three children caused his son Rick to take the Kreuz name to a new building down the road. Fortunately, daughter Nina Schmidt Sells and her son, John Fullilove, kept the fires burning and reopened under the current name." Thanks for the additional info, chascates. I live about 30 min from here, and the story as I heard it was that when the dad died he left the building to one kid, and the actual business to another... so they would have to work together. Well, there were disagreements on how/what/when to serve, so the owner of the building drove up the rent until the owner of the business was forced to move. Supposedly they still don't talk, and people in the town totally took sides and will refuse to patronize the competing business! SPICY STUFF! We are looking forward to trying the tasty BBQ too! We just moved to Houston and I've been nominated the one in the family to research and locate the pot of gold... aka--the tast-ee-st BBQ in TX. Rumor has it that both locations are neck and neck. Had no idea Kreuz and Smitty's were related. NOTE: You're not alone... My sister and I share similar circumstance(s) as alleged above. To this day, we do not speak. It's a shame. Smitty's is definitely the best - the sausage and brisket win hands down! In my opinion Smitty's BBQ has a more downhome flavor - the other is more commercialized! I used to go to Smitty's as a kid and it is still the best! 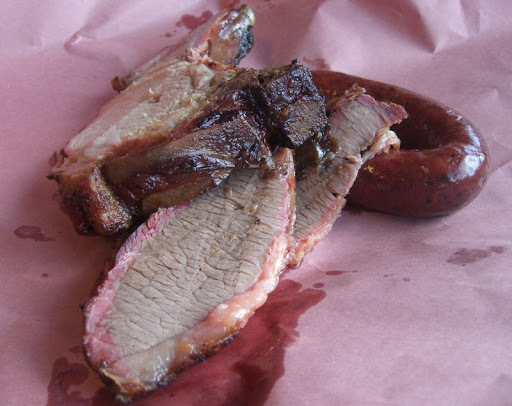 If you want real downhome Texas BBQ choose Smitty's! 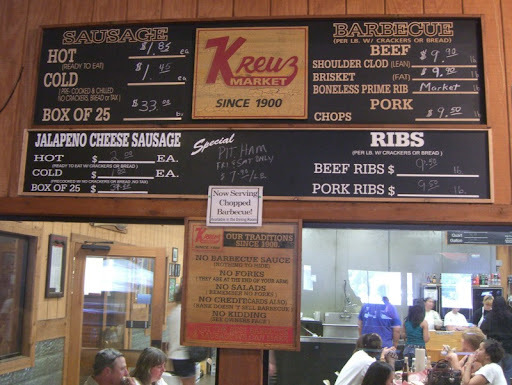 Went to Kreuz this past weekend (inspired by your post) and it was the best meat I ever had. The beans and sauerkraut were also amazing. *Nobody* went to Smitty's as a kid, unless they're very young. They went to Kreuz. 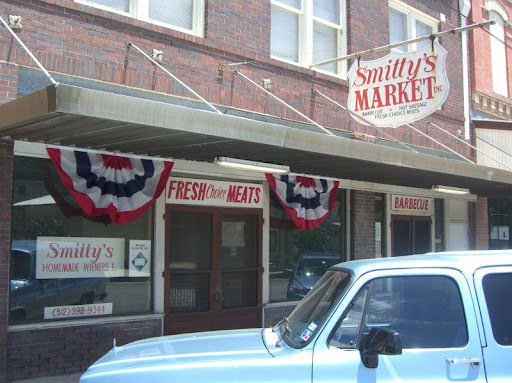 Smitty's didn't exist until 2000 or so resulting from Nina running Rick's Kreuz business out of her building so she could open her own. The story I heard is that Rick BOUGHT the business from Dad. But he didn't buy the building. Instead the building was left to Nina who decided to raise the rent on her brother Rick. Then Rick did not feel he could pay that and so he moved locations. He went as far as to talking that coals! 3 weeks later both Smitty's and Kreuz opened. My experience was the opposite of the writer. We went to Smitty's first, then Kruez. I liked Smitty's a lot more, thought the brisket had a deeper flavor and was more moist (we always order off the backend when we can). The sausage was about the same in both places. I recently took a friend to Smitty's (he had gone to Kruez the week before) and he concurred that Smitty's was better. Of course, I think I like Snow's brisket better than both places. Here's an article from Austin and the true story behind the feud. Being from Austin, I have had both numerous times. I am a Kruez myself. Their ribs are great too. 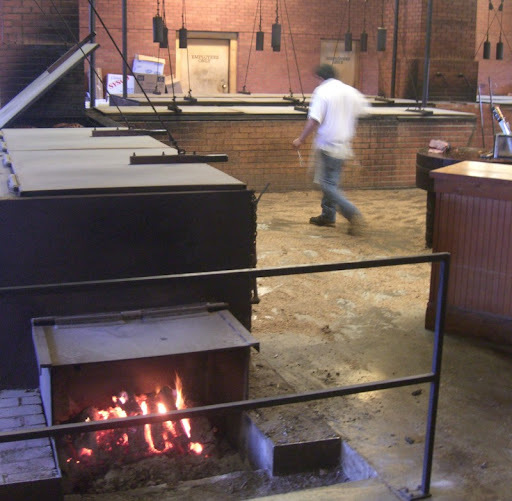 In my opinion, Kreuz beats Salt Lick as well.